“I always start each day by writing. 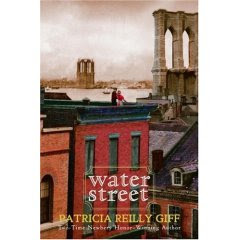 The life of two time Newbery Award author Patricia Reilly Giff began in Brooklyn, New York on April 26, 1935. As a child, her favorite books included: Little Women, The Secret Garden, The Black Stallion, the Sue Barton Books, and the Nancy Drew series. She was so intent on reading that her sister had to grab books out of her hands to get her attention. Later on in her life Giff found her children having to do the same thing! She earned her B.A. from Marymount College and upon the suggestion of the dean she became a teacher. Her career as an educator lasted for 20years during which she earned an M.A. from St. John’s University then went on to receive a Professional Diploma in Reading and a Doctorate of Humane Letters from Hofstra University. Giff and her husband live in Weston, Connecticut. They have two sons Jim and Bill and one daughter Ali whose names often appear in her books. In 1990 Giff along with her husband and her children opened a children’s book store The Dinosaur’s Paw which was named after one of her Kids of the Polk Street School novels. The store is located in Fairfield , Connecticut. In Pictures of Hollis Woods, Hollis is a girl who was abandoned at birth. She was named after the area in which she was found. And, yes, it is a real place in Queens, New York. All Hollis has ever wanted is to be part of a family. She has been in the foster care system for her entire life and has been shuffled from home to home. One summer Hollis spends her time with a family at their vacation home. She has grown comfortable with the Regans, enjoys spending time with their son Steven and savors each day she spends with them. Toward the end of the summer the family approaches Hollis telling her that they want to make her a part of their family. Hollis has finally gotten what she has wanted her entire life. Then what went wrong? Hollis is at her special place on the lake doing what she loves to do and lives to do, draw. Time stands still for her and she is late getting back to the Regan’s home. Steven takes the old truck without his father’s permission searching for Hollis so that she is back in time. While Steven and Hollis are driving back to the lake house Steven looses control of the truck. The truck flips and rolls down an embankment several times. Hollis sustains minor injuries but Steven is more seriously hurt. Feeling she is to blame for the accident she runs away from the Regan’s back to her social worker. After several visits from Mr. Regan urging Hollis to return to the family she still refuses. Hollis is then placed with Josie who is a retired art teacher. Josie, who had had many foster children in the past, now lives alone. Hollis relates very well with Josie due to their common background, art and Josie’s laid back yet caring nature. During her short while with Josie, Hollis begins to notice that Josie is getting more and more forgetful. One day, after school, as Hollis arrives back at Josie’s home she notices that her social worker is paying a visit. The social worker then breaks the news to Hollis that she no longer can remain with Josie due to her decreasing mental awareness. Hollis decides that she and Josie need to leave that night. Where do Hollis and Josie wind up? Hollis takes Josie to the Regan’s lake house. After several days and Hollis noticing that unusual things are showing up at the house she finally discovers Steven had been helping them. They call the Regan’s who in turn contact the social worker. They all come together and celebrate at the lake house. Finally there is a happy ending. Hollis gets the family she has always dreamed of and Josie gets the help she now requires. and her older sister gets married and leaves for a better place as Nory often refers to it; Smith Street… Brooklyn… New York… America. During her efforts to remain in the Ryan family home and keep a bit of food on the table she is befriended by Anna . Anna, who is a herbal practitioner, does have a little money and a cow which allows her to have some of life’s basic needs. Nory begins to spend more and more time with Anna who, without Nory realizing, is training her to take over her healing practice. With life becoming bleaker, Nory’s grandfather, older brother and sister decide to leave the town in order to find work. This leaves Nory with her baby brother, Patch, to remain at home. With day to day living becoming increasingly difficult, Nory makes the heartbreaking decision to send her baby brother with neighbors on a ship to America. Nory remains with Anna as they try to plan how they will find what the need to stay alive. One evening as they sat in front of a fading fire a knock on the door is heard. When Nory opened the door there stood a man overcome with exhaustion. Faintly you could here him utter the words Nory Ryan. Nory introduced herself and he handed her an envelope which she slowly opened. There she found two tickets to America one for her and one for Patch. Nory thought, “Patch is already gone.” Then she looked at Anna. Surely Anna would go with her but they both looked at each other and knew. Anna would remain in Ireland but Nory would venture to America. The characters Hollis Woods and Nory Ryan depict some of the same personality traits. They are determined, caring and self sufficient young women who rose out of the depths of despair to live the life they have always hoped for. The theme of family is present in both books. Hollis Woods who has been orphaned at birth has always wished she could be part of a real family. She finds her first family home with the Regans and then again with Josie. Both these situations give Hollis a feeling of wholeness and oneness. Nory on the other hand has a family but little by little looses them. Her mother has died, her father in another city working, her older sister moving to America, her grandfather with her other brother and sister leave the family home in search of work and lastly sending her little brother off to America. Ultimately, they reunite becoming the family they once were. Under the umbrella of family, I would like to include the issue of abandonment which has resulted from the lack of family in both Pictures of Hollis Woods and Nory Ryan’s Song. These characters were tough enough to pull through many adverse situations. Hunger is another subject that is entwined in both books. While Hollis was living with Josie they had a limited amount of money to spend each month and when the end of the month approaches it is very difficult to make ends meet therefore food was scarce. The ability to stretch their resources was a challenge each month. In Ireland, we find Nory going down to the shore trying to find anything that washed up that might be edible or she is scaling cliffs in order to find bird eggs to eat. Giff gives a voice to everyday people who face struggles on a daily basis and it is easy for us to relate to her characters and the hardships they face. Friendship is another topic that is strong in both stories especially friendships with older people. The relationship between Josie and Hollis is heartwarming. Hollis has an affinity towards Josie from the very start and instead of Josie taking care of Hollis the opposite occurs. Hollis id given the opportunity to care for someone else. Josie truly depended on her and she was not going to let Josie down. During her life people had disappointed her but she will not disappoint Josie. Turning to Nory Ryan’s Song, the relationship that began as a very awkward and intimidating one evolved into a strong attachment. Nory depended on Anna for a great number of day to day decisions since she had no other adult figures in her life at the time. Anna did count on Nory to assist her with tasks as she was molding Nory to take on her healing practice. Anna did realize what a gifted and determined young woman Nory was. It was a difficult decision for Nory to leave Anna to rejoin her family and eventually go to America. She was willing to remain with Anna but Anna persuaded her to go. It took a great deal of strength on both sides to remain true to their decisions. Both of these stories exhibited young women with an enormous amount of dedication and determination. They both had a desire and worked diligently to attain the outcome they only once wished for. Even though these novels were set in very different times and places the similarities were very clear. Giff pulls from her own family history and well as the lives of those she has come in contact with. It is very obvious that she is very in touch with the lives of ordinary people. I look forward to reading more of her work.